Hope's Cafe: Old Barn Rescue Wall Decals-Review and Giveaway!! One of the things I like about Old Barn Rescue is you get to choose the color for your decal, and they have 60 colors to choose from! I was very pleased at being able to find a color that matches my bedroom decor. The decal came with detailed instructions on applying. It was very easy for me to follow along and get my decal put up, looking like it was professionally done! I can't get over how nice it looks, yet how easy it was! "When Jan’s dad told her he needed to tear down their childhood barn she couldn’t stand the thought of all that beautiful weathered, 120-year-0ld wood going to waste. She and her good friend, Adonna, started creating and, voila, Old Barn Rescue Company was born. In the fall of 2008, due to the popularity of Adonna’s hand-lettering, we began Old Barn Rescue Company’s Wall Graphic Division. Now you can have Adonna’s gorgeous writing on your wall without the added cost of her visiting your home to do it herself! As you can see, Old Barn Rescue is still creating one-of-a-kind wall decor from up-cycled doors, windows, furniture and molding. We love finding just the right door knob or hook, and getting our hands dirty digging for the perfect treasure to finish a piece. You’ll find all kinds of wonderful, eco friendly decor in our Old Barn Rescue section of this site. Check back often though as they fly off the shelves! 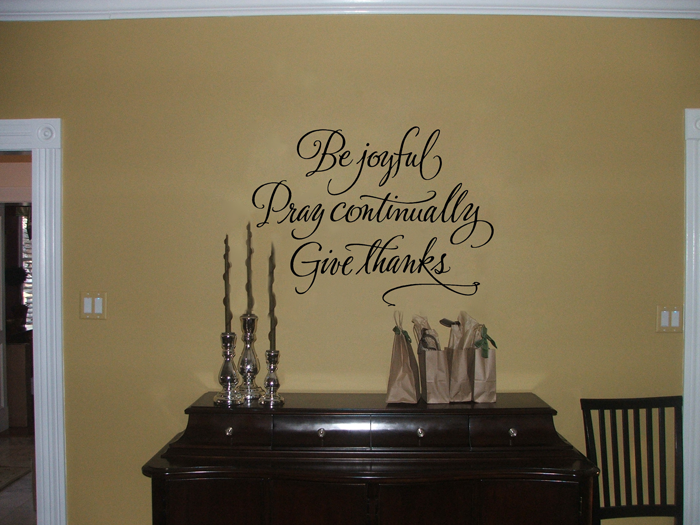 We also love the versatility and ease of the cut vinyl. Adonna is always coming up with new wall graphic designs, most of which are hand-drawn, making them unlike anything else out there. 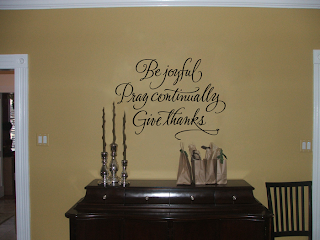 She is always being asked, “Where did you buy your fonts?” Her hand-lettering now graces the walls of many a nursery and bedroom, kitchen and bath, classroom and storefront. As two MWK’s (mom’s with kids) we enjoy being creative and are committed to making sure you, the customer, love what we create." Old Barn Rescue is giving a Wall Decal (winner's choice up to $32.00 value) to one of my readers!! Go to Old Barn Rescue and tell me which decal you would pick if you won! This giveaway ends Friday, October 22, 2010 at 11:59 p.m. Please leave a valid email address in each comment, as this is how the winner will be notified. Winner will have 48 hours to respond, or another winner will be chosen. Giveaway open to US residents only. Disclaimer:I was not monetarily compensated in any way for this review. I did receive product for the purpose of review. All thoughts and opinions are mine. All quotes taken from the Old Barn Rescue website. I like the Bless This home quote. I would like to get the Dogwood branch with bird! Following you on GFC, post 1! Following you on GFC, post 2! "I have loved you" is my favorite! (though I am on the lookout for an Eiffel tower) I've bookmarked the website, I love it. I like the Blessings Decal:) Please enter me. Thanks!